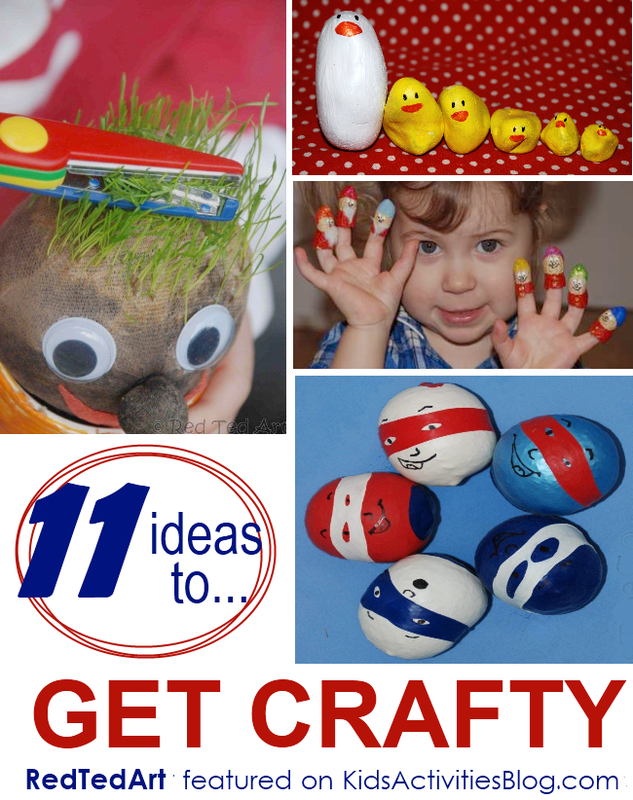 These kids craft ideas are creative and fun from Red Ted Art. We at Kids Activities Blog *love* kids craft ideas and admire Maggy’s creativity. This week we are featuring Maggy and her kids activities blog, Red Ted Art. RedTedArt was one of my first “blog crushes” – in my early days of blogging I stalked her blog. She has dozens of easy crafty ideas that your kids can enjoy on her blog and she has graciously shared 11 of them with us this week. Re-use a pair of old hose to create a grass head. What a fun spring craft for kids! Watch the hair of grass grow. Re-create the characters in a favorite story using stones. Ted made a collection of little ducks in this Easter craft from rocks. Have fun eating and being dramatic with peanut husks. The empty husks make terrific DIY finger puppets. Have some broken balloons?? Dried rice or lentils that are past their prime? Make a set of character juggling balls. This winter, make ornaments for the birds! They used old food tubs and lids along with colorful seeds and bits to create ice ornaments to decorate outdoor trees. Craft with bubble packaging. Maggy and Red Ted studied the seasons of the year and created masterpieces of art together. Add some magic to the laundry (or pretzel bags – we use clothespins to keep bags closed). Mermaids are magical and clothespin people are fun. Love this kids craft tutorial on how to create your own “people”. Use scraps of fabric to help your child learn to sew with this simple lavender bags craft. These would make great gifts for your kids to make. Make stamps from potatoes to create a set of cards for Grandma! These kids craft cards have a city scape. Use toilet paper tubes to create “Loo Monsters”. Did I mention that Maggy/Red Ted Art is a UK blog?? Love the lingo, and this simple kids craft. Be dramatic with your kids and create a Mask using recycled items – this craft corresponds with the book, “Where the Wild things Are“. You can find Maggy and Red Ted on Facebook, twitter, G+and they have a fun collection of boards on Pinterest. 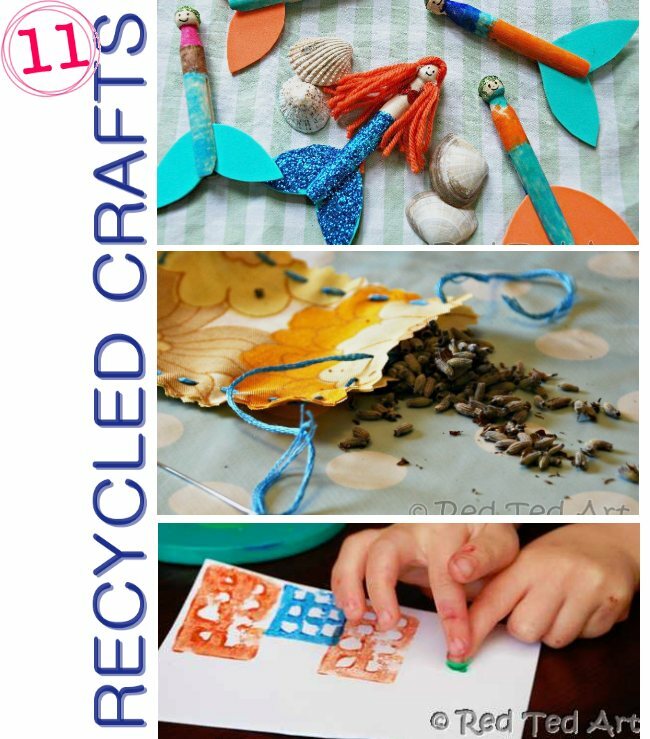 What recycled items do your kids *love* to craft with?